Who doesn't love St. Patrick's Day?!?!?!?!?! And of course, how could you not love leprechauns???? I had the chance to go out with a couple of my girlfriends last night for some much needed girl time. It wasn't necessarily in honor of St. Patrick's Day, but just because mommies need nights out!!!! Don't get me wrong, I love my husband and kids and LOVE our family time. But, isn't it just SO nice to get away with your girlfriends? Without kids, we actually have time to chat, catch up, and of course drink some wine. 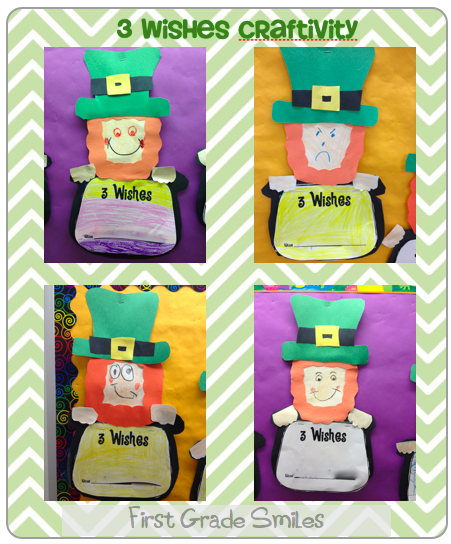 Well, here is what we did in my classroom to prepare for St. Patrick's Day. 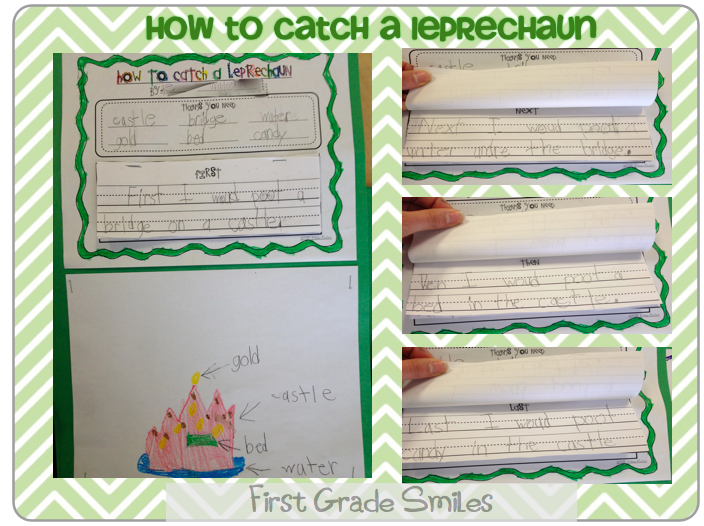 By the way, I had high hopes of doing some super cute leprechaun trickery....but alas, time got away from me and it did not happen. I found some great inspiration for next year from my blogging friend Irene at Learning with Mrs. Leeby. You need to check it out - she is super cute and has great ideas!!! 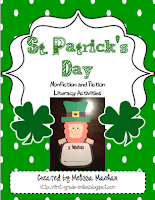 First off was this nonfiction reader about St. Patrick's Day. It is very basic, but I loved teaching the kids a few small facts about St. Patrick's Day. Next up was this 3 Wishes craftivity. Can you believe that I wrote a poem???? 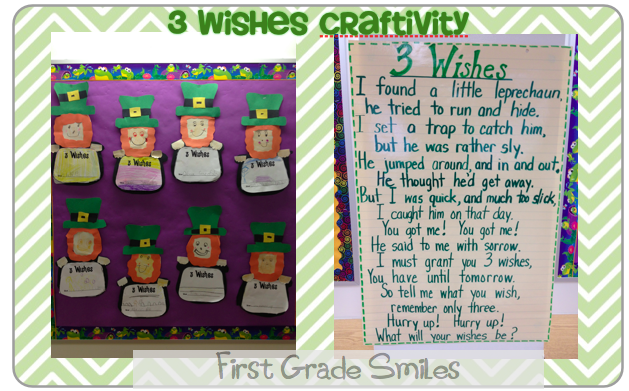 I'm not saying it's anything amazing, but I really loved using this and having my kiddos write what their 3 Wishes would be if they caught a leprechaun. I was surprised to see that many of my kids wished for things like ice cream and pizza. Really??? But then some other ones got into it and wished for 100 dollars or a monster truck. Don't you just love how firsties think $100 is so much money. Adorable!!!! My favorite was the little boy who first wished for a driver's license, then for a car, and finally to be 16 so he could get his license --- only he switched the digits and wrote "I wish I were 61." I said, "Why do you want to be 61?" He says, "No way, I don't want to be 61 - I meant 16!" and erased it immediately. I love the leprechaun that is mad! I think he's not happy to have to grant 3 wishes. Haha!!! First I get a rock, fishing pole, and a coin. Next I put the coin on the fishing pole. Then I yank hard! Then I would be quiet. It would not rain. Last, I will set a trap for a leprechaun. First I would put a bridge on a castle. Next I would put water under the bridge. Then I would put a bed in the castle. Last I would put candy in the castle. **Did you see that she spelled put --- poot? Do you ever just not correct a student because it's just so cute how they think words are spelled. I also think I need to help this little girl develop her writing. 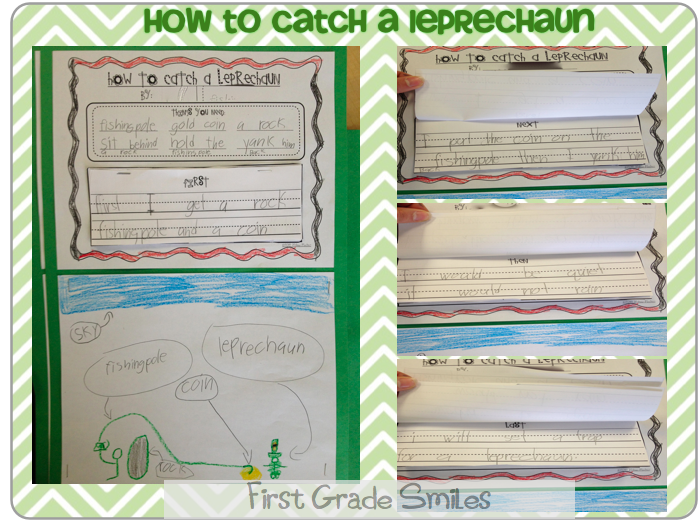 I'm not quite following how she will actually catch the leprechaun. It seems that this is just where she will keep him when she catches him. Still - it's adorable!! I hope you all have a great St. Paddy's Day! 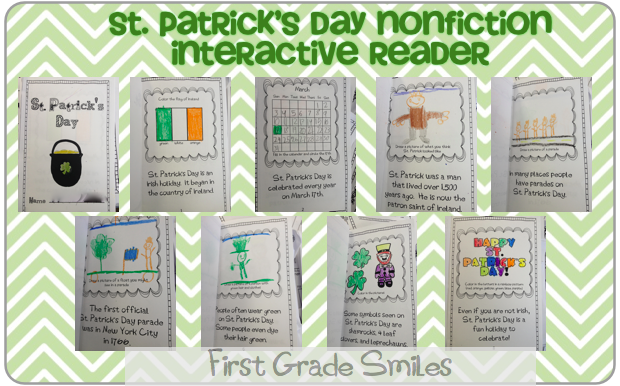 If you like these activities and want them for next year, you can check out my St. Patrick's Day unit. Just click on the picture. I love that spelling, ha! My son was just learning to spell -igh words and when spelling "sight" he completely dropped the 'g' and inverted the 'ih' and well, you get the rest. . . So cute! Thanks so much for the sweet words and link back! I am so lucky to have bloggy friends like you, Melissa! Oh my gosh - we should do a linky with the funniest misspellings from our students or children!!!! I had a little girl who tried to write the sentence "I got a new bike for Christmas". Well she didn't quite understand silent e and used a ck at the end and then she reversed her b to a d. Hilarious!!! Easter Freebie Just for My "Peeps"